Deep South Containers is a waste removal company serving Lafayette, Sulphur, Lake Charles and surrounding cities in Louisiana. Deep South Containers offers a full line of both Roll-Off Dumpsters and Compactors to handle all of your disposal needs. Deep South Containers has what you need for all types of construction, demolition, spring cleaning projects, and permanent service. Whether you are a homeowner needing to clean out your garage or attic, a landlord needing to clean out past renters left behinds, a contractor remodeling a home or building a new residence, a commercial contractor building a new office building, hospital or demolishing a condemned building, we have the right size container for you at the right price. Own your own container? We also service all sizes of roll-off dumpsters. Deep South Containers offers a full line of Front Load Dumpsters for managing waste production for your business. Ideal for long term commercial use, Deep South Containers can provide you with the perfect front load container and waste collection program to meet your needs. Managing your waste and reducing cost is very important in today’s economy. 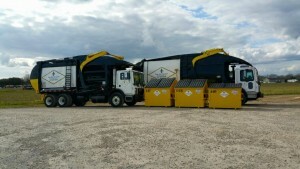 We specialize in reducing our customers’ operational costs by developing solid waste collection that is flexible to fit all types of waste needs.We offer volume pricing with greater flexibility and lower overhead expense for our customers. When renting a container from Deep South Containers, you will never be surprised with any hidden fees. Unlike many other waste removal companies, we do not add on fuel surcharges or environmental fees. The rental price you are quoted is the fee you pay. Through our affiliate company, Event Solutions, we also offer septic tank pumping Lake Charles residents can count on for the best service and professionalism. We also serve all of Louisiana and East Texas.